The mutuum contract, as noted in the previous post, is the basis of fractional reserve banking, and involves the loan of money to a bank as a mutuum, giving it ownership of the money, and the promise by the bank to return on demand money up the same amount. This is a demand deposit. I will quote here some useful sources on the mutuum contract in the US and British law. SECTION 2. OF GRATUITOUS LOAN FOR CONSUMPTION, OR mutuum.1089. Mutuum, or loan for consumption, is a contract by which the owner of a personal chattel, of the kind called fungibles,(c) delivers it to another by which it is agreed that the latter shall consume the chattel, and return at the time agreed upon, another chattel of the same kind, number, measure or weight, to the former, either gratuitously or for a consideration; as if Peter lends to Paul one bushel of wheat, to be used by the latter, so that it shall not be returned to Peter, but instead of which Paul will return to Peter another bushel of wheat of the same quality, at a time agreed upon. The person who delivers the article to be used is called the lender, the other is called the borrower. 1090. This contract differs essentially from a loan for use, or commodatum. In the latter the title to the property in the thing lent remains with the lender, and, if it be destroyed without the fault or negligence of the borrower, the loss will fall on the lender, the rule res perit domino, applying in such case. On the contrary, by the loan for consumption, or mutuum, the title to the thing lent passes to the borrower, and in case of loss, he must bear it. Mutuum bears a strong resemblance to barter or exchange; in a loan for consumption the borrower agrees to exchange with the lender a bushel of wheat, which he has not, but expects to obtain, for another bushel of wheat which the lender now has and is ready to part with. § 1.—Of the nature of the contract of loan for consumption. Art. 1.—What constitutes the essence of this contract. 1091. There must be, 1, something lent which is consumed by use; 2, that it be delivered to the borrower; 3, that the property in the thing be transferred; 4, that the borrower agree to return as much in kind; and, 5, and lastly, the parties agree on all these things. 1092.—1. There cannot be a loan for consumption unless there be a thing loaned, which is to be consumed, and it must be lent for that purpose. 1093.—2. It is also of the essence of this contract that the lender deliver to the borrower the thing lent. But there are some exceptions to this rule; if Peter agrees to lend to Paul one thousand dollars, which money has been already delivered by Peter to Paul on a special deposit, the agreement will of itself change the property; while it was on deposit it was at the risk of the depositor, but the moment the contract is turned to a loan, the money is at the risk of the borrower, the title to it being then in him. 1095.—4. The borrower who receives the things loaned must agree to return the same quantity, weight or number, of the same kind of goods. If Peter were to borrow of Paul one hundred bushels of corn, and agree at a future time to pay him in money, for the corn, one hundred dollars, the contract would not be a loan for consumption, but a sale; and if, instead of money, he agreed to return to him seventy-five bushels of wheat, the contract would be a barter or an exchange. 1096.—5. As in all other contracts, the parties to this must agree upon all the essential matters which belong to it.” (Bouvier 1851: 441–443). This is clearly the legal framework under which fractional reserve banking was conducted in the US, and obviously English law influenced American law on this point. “When a man lends a book, or any other chattel, to his friend, he never parts or dispossesses himself of the property in it. He is entitled to have that very book, or the very chattel, back again. There is no exchange, and no new property created. And only one party can have the use of the book, or the chattel. But in all cases whatever of a loan of money, the lender absolutely cedes the property in the money to the borrower, and it becomes his absolute property. What the lender does acquire is the right, or property, to demand back an equivalent amount of money, but not the specific money. A loan of money, is therefore, always an exchange, and in all such cases, there must, by necessity, be a new property created; and this property may be sold and transferred like the money itself. In the loan of a book, or a chattel, the right to it, or property, of the lender, is never severed from it; in a loan of money, the right, or property, of the lender in it is always severed from it, or rather, transferred to the borrower; and the new right, or property, created in the lender is termed a Debt, or Credit, and when the debt is paid, or, in common language, the loan returned, this new property is destroyed. Hence we see that there are two distinct species of loan: the one where the lender has the right to have the very thing returned, the other where he has only the right to demand to have an equivalent amount returned. Now all commercial loans are of the latter species: they are all sales, or exchanges, and they are never of the former sort; and all the confusion on the subject has arisen from not observing this distinction.” (MacLeod 1902: 81). There are some other useful sources below. And it should be noted that European law was itself based on Roman law, where the mutuum was also understood as a loan where ownership of the money passed to the bank; this was the legal framework for money loans that were recallable on demand by the creditor in ancient Rome (Gamauf 2006). “The English term loan has a variety of meanings. It is used to designate, 1st, the commodatum of the Roman law … a transaction by which an article of use, such as a book, a horse, &c, is gratuitously delivered by the owner to another for his mere use or accommodation, on the simple condition of the borrower returning it in the same state in which he received it. 2ndly. The mutuum, or gratuitous loan of those things which in the phraseology of the Scottish law are called fungibles, and can be used only by actual consumption or expenditure, such as corn, wine, money, or the like, the lender of which absolutely abandons the ownership on condition of the borrower substituting by way of return the specific value in number, weight, and measure. 3rdly. The foenus, or loan at interest, which in most countries has been the subject of artificial regulations.” (Pulling 1851: 202). “In order to ascertain what power the bank had over the funds of Dawson, and the duty enjoined upon her by law, it is necessary first to determine whether they were held as a special or general deposit. If the funds were held as a special or general deposit, the authorities all agree that the bank had no right to use or dispose of them; but was bound simply to keep them and restore to the depositor the identical funds deposited. If they were held either as a general or irregular deposit, the rule appears to be equally well established that, upon such deposit being made, the legal interest in the money or thing deposited, became immediately vested in the bank, and the relation of debtor and creditor was thereby created between the parties; that is, as between the bank and Dawson, the latter became the creditor and the former his debtor, to the amount or value of the deposit. And in such case, the bank having acquired the absolute property in the thing deposited, could lawfully dispose of them in any manner she pleased, her obligation being only to restore to the depositor the like sum or value in kind with interest, but not the identical thing deposited. Commercial Bank of Albany vs Hughes, 17 Wend. 94 Foster et al. Ex’s vs. The Essex Bank 17 Mass. R. 477. Story Com. on Bailment 60. lb. 66. From a careful consideration of the authorities on this subject, we understand the general rule to be, that where money, not in a sealed packet, or closed box, bag or chest, is deposited with a bank or banking corporation, the law presumes it to be a general deposit, until the contrary appears; because such deposit is esteemed the most advantageous to the depositary, and most consistent with the general objects, usages, and course of business of such companies or corporations. But if the deposit be made of any thing sealed or locked up or otherwise covered or secured in a package, cask, box, bag or chest, or any thing of the like kind of or belonging to the depositor, the law regards it as a pure or special deposit, and the depositary as having the custody thereof only for safe keeping, and the accommodation of the depositor.” (Pike 1845: 296–297). Although the language is unusual, it seems that the “special or general deposit” must be the depositum and that “general or irregular deposit” refers to a mutuum. The tradition of sealing money in a bag, chest or box to indicate that it was to be held in safekeeping as a depositum (not as a mutuum) goes right back to English banking practices that have been examined by Selgin (2010). “The usual course of such business is, for the dealer to deposit his money with the bank, to be repaid upon his checks or drafts, or in taking up his notes or acceptances made payable at the bank. It is not strictly a deposit, nor a bailment of any kind; for the same thing is not to be returned, but another thing of the same kind and of equal value. In the civil law it is called a mutuum, or loan for consumption. Except where the deposit is special, the property in the money deposited passes to the bank, and the relation of debtor and creditor is created between the parties. (Commercial Bank v. Hughes, 17 Wend. 94.) Still, the commonly received opinion is, that the banker cannot be sued for the money until after the customer has drawn for it, or in some other way required its repayment. Mr. Justice Story says, the bank is to restore the money ‘whenever it is demanded.’ (Story On Bailm. 66, § 88; and see Marzetti v. Williams, 1 Barn. Ad. 415; Chit. On Bills, 547, ed. of1839; Chit. Jr. On Bills, 44.) Judging from the ordinary course of this business, I think the understanding between the parties is, that the money shall remain with the banker until the customer, by his check, or in some other way, calls for its repayment: and if such be the nature of the contract, the banker is not in default, and no action will lie, until payment has been demanded. No one could desire to receive money in deposit for an indefinite period, with a right in the depositor to sue the next moment, and without any prior intimation that he wished to recall the loan.” (Denio 1845: 299). Bouvier, John, 1851. Institutes of American Law, R.E. Peterson, Philadelphia. Denio, H. 1845. Reports of Cases Argued and Determined in the Supreme Court and in the Court for the Correction of Errors of the State of New-York. Vol. VI., Gould, Banks and Co. New York. Pike, A. 1845. Reports of Cases Argued and Determined in the Supreme Court of Law and Equity of the State of Arkansas Volume V. B. J. Borden, Little Rock. If Fractional Reserve Banking is Fraudulent, Why isn’t the Insurance Industry Fraud? That is the question never properly answered by opponents of fractional reserve banking (FRB), and a blatant logical contradiction in their anti-FRB position. The Rothbardians might argue as follows: an institution taking money from its clients and contractually obliged to return to them exactly what they are rightly entitled to is fraudulent when such an institution could never honour all the clients’ claims at one time, if all or even a large number required some or all of the money they are entitled to. If so, they have destroyed the basis of the insurance industry, as has been pointed out by Gene Callahan here (“The ‘Immorality’ of Fractional Reserve Banking Revisited,” May 23, 2009). The argument that FRB is fraudulent merely because there are certain possible circumstances when the bank cannot fulfil its promise to pay all its clients on demand is utterly unconvincing. First, virtually all business investment and insurance industries could be regarded as inherently unstable, like FRB, because the future is uncertain. But the insurance industry – just like FRB – can be operated profitably over long periods and is stable. When some unforeseen event happens like a massive natural disaster, the insurance companies could be overwhelmed by claims and collapse, because they cannot pay. If all or a very large number of the policy-holders of an insurance company suddenly needed insurance payments over a brief period, the company might not be able to honour all its claims or find a credit line to allow it to do so. But that is not an even remotely serious argument against insurance, because all business activity involves risk and uncertainty, and both clients of a business and the business itself can never escape uncertainty and the possibility that the business’s contracts might not be honoured. In the same way, FRB might be stable over long periods. But, when some unforeseen event happens (a collapse in export demand, rumours about some bank, a change in subjective business expectations), the FRB bank might be overwhelmed by a bank run and collapse, because it cannot pay. The issue is whether it can meet demand from its depositors out of reserves, sale of financial assets and loans from other banks, without a liquidity crisis. Many FR banks are perfectly capable of doing that in a crisis, while others are not. That some banks cannot honour all their claims under certain unusual circumstances is not a serious moral argument against FRB. If it were, then all insurance industries would be unacceptable on moral grounds as well. The anti-FRB libertarians will no doubt then fall back on the argument that insurance is not fraudulent because when you pay premiums that money becomes the property of the insurance company, and is not money retained as your property, whereas in FRB you do retain ownership of your demand deposit money. But that shows the most contemptible ignorance of the nature of FRB. If you put your money into a mere holding warehouse, then the owners or managers of the warehouse have no property rights with respect to your money stored there (such money is legally known as a depositum, which means “something given or entrusted to another for safe-keeping”). The identical deposit must be returned to the owner or, in legal terms, it must be returned in specie (“in its own form”). It is certainly true that many members of the public may be ignorant of these facts above. Yet if you have failed to read your fractional reserve bank contract, whose fault is that? As a client, you ought to understand the contract that you sign. The solution to the problem of modern people not understanding the nature of fractional reserve banking is simply legislation to make banks explicitly explain to potential customers how FRB works. Specifying to clients that the property rights to the money had passed to the bank and in return an IOU or credit had been granted to the depositor, that the bank lends your money out, and that it will return not the same money but other money from its reserves will solve the moral problem of clients not understanding the nature of FRB. Under these circumstances, FRB is not fraud. It is a free contract. The Rothbardians like to tout themselves as the most pure, heroic defenders of free markets. They are not. The anti-FRB Rothbardians are coercive, anti-freedom violators of private liberty and free contract in their opposition to FRB. I’ll quickly deal with the status of FRB in ancient Rome here, because when discussing the subject you frequently find anti-FRB libertarians invoking the work of Huerta de Soto (2006), and arguing that FRB was illegal or considered immoral at Rome. In fact, Roman law appears to have allowed FRB under the mutuum contract, a real contract under which a fungible good like money was lent to a bank and ownership of the money passed to the bank. The bank was required to return an equivalent amount of money, after a certain time or on demand. (4) depositum or depositum regulare (bailment for safe keeping). In Roman law, there was also a type of contract called the depositum irregulare which, when involving money, allowed the transferral of ownership (dominium) of the money. Because money can be regarded as representing a certain value, what is deposited is a quantity of a thing (quantitas) and not an individual thing itself (corpus). The depositor thus receives back the same quantity (tantundem) of money, not the same money itself (Zimmermann 1990: 215–216). In the time of the Roman jurists Ulpian/Gnaeus Domitius Annius Ulpianus (c. 170–223 AD) and Papinian/Aemilius Papinianus (142–212 AD), however, it appears that the depositum irregulare was merely considered to be a type of mutuum, and it may well be that the whole legal concept of depositum irregulare is a development of later legal theorists, unknown to jurists of the second or third century AD (Oudshoorn 2007: 135–136; cf. Adams 1962; for the specialist literature, see Seidl 1951; Geiger 1961; Litewski 1974; and Gordon 1982). Therefore the mutuum was the legal framework and concept under which fractional reserve banking was conducted in ancient Rome (Zimmermann 1990: 218). Whether the mutuum was a time deposit or a demand deposit depended on the type of contract between the two parties, and there is no reason to think that fractional reserve banking was held as either immoral or illegal (for how Roman law influenced Medieval law on banking, see Dotson 2004: 89–92). The evidence for the existence of FRB in the Roman Republic and Roman Empire is overwhelming (Harris 2006: 11; Harris 2011: 236). There is not one shred of evidence that it was regarded as immoral or prosecuted as a crime. But let us suppose, for the sake of argument, that in fact the Romans did regard FRB as immoral. Even if correct, that would be a red herring and an informal fallacy called the appeal to tradition/argumentum ad antiquitatem, irrelevant to the question whether in the modern world FRB is immoral and fraudulent. The Romans, for example, had sumptuary laws to prohibit the consumption of certain luxury goods, supposedly to stop the spread of immoral luxury and preventing the moral and physical health of Romans from degenerating. Is that a remotely convincing argument by itself for prohibiting consumption of certain luxury goods today? Not in the least. Adams, B. 1962. “Haben die Römer depositum irregulare und Darlehen unterschieden,” Studia et documenta historiae et iuris 28: 360–371. Dotson, John E. 2004. “Banks and Banking,” in C. Kleinhenz (ed. ), Medieval Italy: An Encyclopedia. Vol. 1, A to K, Routledge, London. 89–92. Geiger K. 1961. Das depositum irregulare als Kreditgeschäft, Freiburg. Gordon W. M. 1982. “Observations on depositum irregulare, III,” in Studi in onore di Arnaldo Biscardi (vol. 3), Ed. Cisalpino-La Goliardica, Milan. 363–372. Litewski W. 1974. “Le dépôt irrégulier,” Revue internationale des droits de l’Antiquité 21: 215–262. Seidl, E. 1951. “Der Eigentumsübergang beim Darlehen und Depositum irregular,” in Festschrift für F. Schulz, Böhlau, Weimar. 373–379. Selgin, G. 2000. “Should We Let Banks Create Money?” Independent Review 5.1: 93–100. Oudshoorn, J. G. 2007. The Relationship Between Roman and Local Law in the Babatha and Salome Komaise Archives: General Analysis and Three Case Studies on Law of Succession, Guardianship and Marriage, Brill, Leiden and Boston. Zimmermann, R. 1990. The Law of Obligations: Roman Foundations of the Civilian Tradition, Juta & Co, Cape Town. Are Cantillon Effects an Argument Against Government Spending? The answer is: not even close. You can frequently find Austrians or free market libertarians arguing against government intervention – particularly Keynesian policies – by appealing to “Cantillon effects.” The question is: do Cantillon effects provide a convincing, sufficient argument on their own against government intervention by spending programs that increase the quantity of money? Not on their own they don’t. First, a government that engages in deficit spending covered by bond issues to the domestic private sector is not increasing the money supply, so presumably the Austrian objection is to deficits covered by direct central bank money creation (the issue of fractional reserve banking is a separate one, because private fractional reserve banks could exist without any government even existing). Secondly, the assumption underlying both the quantity theory of money and the idea of Cantillon effects is that money supply increases are merely exogenous, which ignores the fact that in the modern world money supply is mostly endogenous (this does not deny of course that you can sometimes get exogenous increases). But let us put aside these latter concerns for the moment. The Cantillon effect is an idea derived from the work of Richard Cantillon (c. 1687–1734; for his life and work, see Pressman 2006: 17–20), in his Essai sur la Nature du Commerce en Général (Essay on the Nature of Trade in General), which was composed between 1730–1734 but published in 1755 (although the expression “Cantillon effect” appears to have been coined by Blaug 1978: 159). The Cantillon effect is the idea that price level changes caused by increases in the quantity of money depend on the way new money is injected into the economy and actually where it affects prices first. New money will then spread out altering the level of prices and structure of prices or relative prices (Blaug 1996: 21). Another way of saying this is that, although prices rise as the quantity of money increases, contrary to the naive quantity theory of money, prices do not rise proportionally, but in a complex manner that depends on who received the money and how they spent it. But, since the Cantillon effect applies equally to privately induced changes in the quantity of money, as well as to government-induced ones, it cannot be a serious objection on its own against government intervention raising the quantity of money unless it also invalidates all private causes of the expansion of the money supply. Austrians favour complete free trade and complete freedom of capital movement. They would demand what would be called absolute liberalization of the capital account. But, since foreigners (from investors in financial markets or foreign direct investment to mere tourists) can cause significant changes in the money supply, it is clear that the actions of private agents also cause Cantillon effects, and in fact with large flows through a country’s capital account even very significant Cantillon effects. If any process that caused Cantillion effects was ruled out because of alleged impairments to economic calculation, then all injection of money via a capital account would be unacceptable under any such Austrian/libertarian argument. Moreover, there is a further difficulty: Cantillon’s monetary theory holds that increases in the velocity of circulation (V) are equivalent to increases in the quantity of money (M), and that is not implausible. Therefore increases in the velocity of circulation would also cause Cantillon effects, and you would then have the bizarre situation where Austrians would logically have to object to any changes in the velocity of circulation as well, to prevent Cantillon effects. “The starting-point and the object of Dr. Hayek’s inquiry is what he calls ‘neutral money’; that is to say, a kind of money which leaves production and the relative prices of goods, including the rate of interest, ‘undisturbed,’ exactly as they would be if there were no money at all. This method of approach might have something to recommend it, provided it were constantly kept in mind that a state of things in which money is ‘neutral’ is identical with a state in which there is no money at all: as Dr. Hayek once says, if we ‘eliminate all monetary influences on production ... we may treat money as non-existent’” [Prices and Production, p. 109]. .... (Sraffa 1932: 42). “Although I have myself given currency to the expression ‘neutral money’ (which, as I discovered later, I had unconsciously borrowed from Wicksell), it was intended to describe this almost universally made assumption of theoretical analysis and to raise the question whether any real money could ever possess this property, and not as a model to be aimed at by monetary policy. I have long since come to the conclusion that no real money can ever be neutral in this sense, and that we must be content with a system that rapidly corrects the inevitable errors.” (Hayek 1990: 87–88). “Hayek’s first approach to monetary problems was to search for a way to neutralize the effects of supply of and demand for money which were independent of at odds with the supply and demand for real goods: a concept of ‘neutral’ money. As it works out, this becomes a strict interpretation of a quantity theory of money, virtually paradoxical in that no change in the supply or demand for money could take place without affecting relative prices; that is, it could not be neutralized.” (Kresge 1999: 7). Even in a Rothbardian world of 100% reserve banking and commodity money, Cantillon effects would still happen if money entered via an anarcho-capitalist country’s capital account, and if increases in the velocity of circulation occurred. Cantillon Effects on their own constitute no argument against government spending that increases the money supply (i.e., such as monetising a deficit as in New Zealand from 1937-1938). If it did, all private sector activity that causes Cantillon Effects would also be unacceptable (if the libertarian objection is economic) or immoral (if the objection is an ethical one). I was going to write a post about this video below, but quickly realised there are doubts about whether this guy was even a financial expert at all. What was the BBC thinking! Blaug, M. 1978. Economic Theory in Retrospect (3rd edn), Cambridge University Press, Cambridge. Blaug, M. 1996. Economic Theory in Retrospect (5th edn), Cambridge University Press, Cambridge. Hayek, F. A. von, 1990. Denationalisation of Money: The Argument Refined. An Analysis of the Theory and Practice of Concurrent Currencies (3rd edn; 1st edn 1976), The Institute of Economic Affairs, Westminster, London. Kresge, S. 1999. “Introduction,” in S. Kresge (ed. ), The Collected Works of F. A. Hayek. Volume 6. Good Money, Part II. The Standard, Routledge, London. 1–36. Pressman, S. 2006. Fifty Major Economists (2nd edn), Routledge, London and New York. The answer to the question posed in the title of my post depends on the proper interpretation of passages in Hayek’s essay “The Campaign Against Keynesian Inflation” (in New Studies in Philosophy, Politics, Economics, and the History of Ideas, London, 1978, pp. 191–232) and in “The Gold Problem” (published in 1937; see Hayek 1999: 169–185). “Even though there are many concerns about organizing public works ad hoc during a depression, everything speaks in favour of having public agencies perform during a depression whatever investment activities need to be carried out in any case and can possibly be postposed until then. It is the timing of these expenses that presents a problem, since funds are often extremely hard to raise in the midst of a severe depression and the accumulation of reserves in good times generally faces the objections mentioned above. There is little question that in times of general unemployment the state must intervene to mitigate genuine hardship either by disbursing unemployment compensation or, as in earlier times, by legislation to help the poor. (Hayek 1999 : 184). If fact, if Hayek really meant what he said in “The Gold Problem” all the rubbish one sees in Russ Roberts and John Papola’s Keynes vs. Hayek rap videos should be doubly embarrassing to them. In these videos they try and smear Keynesian countercyclical policy as “central planning,” yet it would appear that Hayek may actually have supported such a policy in a depression. Evidently the good Professor Roberts and Mr Papola should have read their Hayek more carefully. Perhaps they should make a new video exposing Hayek as a “wicked” and “evil” central planner, himself advocating policies that would take us down the dreaded road to serfdom. (2) If Hayek really wanted to provide “employment through public works at relatively low wages so that workers … move as soon as they can to other and better paid occupations” by government deficit financing or by money creation, then how is his solution to secondary deflation fundamentally different from a Keynesian one? The answer is that it would not be: Hayek comes very close here to advocating a Keynesian solution to the depression, if (and I emphasise this) the political considerations warrant it. This is still quite a startling insight. That should warm the heart of any social democrat. We should reclaim the Hayek who wrote that sentiment. Hayek was a Classical liberal who accepted the argument for a minimal state and here even state welfare for people in distress. If Hayek was pressed, how would he have justified such government welfare in ethical terms? I suspect he would have appealed to some utilitarian/consequentialist ethical theory, a theory which Mises also adhered to. Hayek was really far from the insanity of modern Rothbardian anarcho-capitalists with their natural rights propertarian ethical theory, which, when taken to its logical conclusion, would entail the destruction of our species. Of course, it really doesn’t matter to me whether Hayek advocated quasi-Keynesian policies in a depression in some circumstances. I think his economics is mostly wrong. But the sight of Hayek advocating public works spending is certainty of historical interest. It certainly puts Hayek in a different category from the hordes of Rothbardian Austrians urging liquidationism as the right solution in cases of recession or depression in all circumstances. George Selgin in his recent LSE debate with Skidelsky took Keynesians to task for (allegedly) smearing Hayek as a supporter of liquidationism in the early 1930s. But now it looks like Keynesians could turn the tables on Selgin: it was not mere monetary stabilisation that Hayek urged but fiscal policy. Is that what Selgin would support in a deep depression or to stop a deep depression from happening? “Policies based on Keynesian macro-economic recipes might have succeeded (had they then been tried) in 1932 and did succeed in 1940 because it so happened that at the bottom of the Great Depression as well as during the Second World War all sectors of the economy were equally affected. In 1932 any kind of additional spending on whatever kind of goods would have had a favourable effect on incomes because there was unemployment everywhere, as well as idle capital equipment and surplus stocks of raw materials.” (Lachmann 1973: 50). (1) Ebenstein says: “Hayek became considerably more integrated with the rest of economic academia, at least with respect to practical policy and personal comity—though not with respect to emerging mathematical method—after his initial grand entry at the London school of Economics. While he did not backtrack from his fundamental analyses, he countenanced and even advocated that activist monetary policies could be appropriate policy and that even public works might have a role to play in evening out the vagaries of the business cycle— though he was disinclined to take the latter direction because it ‘might lead to much more serious restrictions of the competitive sphere.’” (Ebenstein 2003: 70–71). (2) I would also note that Hayek’s support for monetary stabilisation in his earlier writings is inconsistent with his call for monetary denationalisation later in life. How would the state prevent a collapse in the money supply when it had no control over it? Ebenstein, A. O. 2003. Hayek’s Journey: The Mind of Friedrich Hayek, Palgrave Macmillan, New York and Basingstoke. Guest, C. 1997. “Hayek on Government: Two Views or One?,” History of Economics Review 26: 51-67. Hayek, F. A. von. 1937. “Das Goldproblem,” Österreichische Zeitschrift für Bankwesen 1.9 (September): 255–271. [English translation in Hayek 1999]. Hayek, F. A. von. 2001 . The Road to Serfdom, Routledge, London. It is not widely known that New Zealand escaped the high unemployment and economic malaise caused by the aftermath of the Great Depression by Keynesian stimulus. I intend to briefly describe this turn to Keynesianism in New Zealand here. The actual contractionary phase of the Great Depression lasted from 1931 to 1933 in New Zealand, and the country experienced a contraction in real GNP of 14.6% from 1929 to 1932 (Rankin 1992: 61). The country left the gold standard in 1931, as the UK did, and its experience of the depression was not as severe as the US, since New Zealand had no collapsing asset bubble in 1931-1933 that had been driven by high levels of private debt. Hence it escaped the severe type of debt deflationary spiral that destroyed the US, though New Zealand’s farmers and mortgage holders did in fact suffer a lesser form of debt deflation. One of the major causes of the collapse was the fall in the prices of export commodities from New Zealand on world markets (a major part of GDP), as this spilled over into falling earnings for the primary commodity sector in dairy products, meat and wool (Hawke 1985: 127-128), and into falls in private consumption and investment spending. 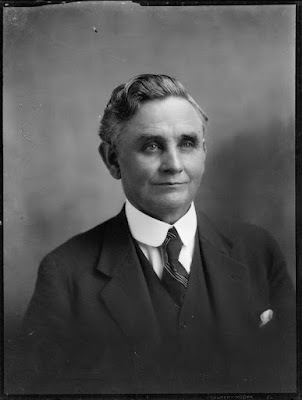 After the actual contraction, unemployment began to fall as a recovery began in 1934 after Joseph Gordon Coates, the Minister of Finance, devalued the currency in January 1933 (promoting some export-led growth), introduced a Reserve Bank for New Zealand (established from 1 August 1934) and a public works program (Wright 2009: 54; Easton 1997: 62; he also restructured some mortgage debt, see Sinclair 1990: 216). The fiscal stimulus was greatly expanded by the new Labour government elected in November 1935 under Prime Minister Michael Joseph Savage (whom you can see in the photo below). Michael Savage presided over the introduction of the welfare state in New Zealand, and the introduction of a universal health care system. His government also introduced a highly expansionary fiscal policy with public works and social spending in 1936, 1937 and 1938. 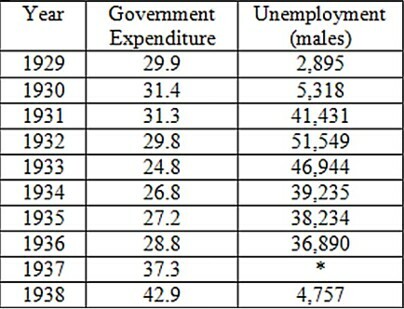 The state of government expenditure and unemployment can be seen in the table below (the data is from Dimand 2002 : 198). “The extensive use of central bank credit ... [sc. in New Zealand was] extremely unorthodox; and the amount involved was, for such a small country as New Zealand, substantial.” (Plumptre 1940: 289). After New Zealand adopted strong fiscal expansion, employment fell very rapidly after the stimulus was introduced in 1936: the number of those on relief programs fell from 38,000 in 1936 to only 8,000 by December 1937 (The New Zealand Official Year-Book, Volume 94, Govt. Printer, 1990). By the estimate of K. Rankin, real GNP soared by about 18% in 1936, 5.4% in 1937, and 7% in 1938 (Rankin 1992: 61), driving real GDP back to its trend growth path by 1937 (Wright 2009: 43; 57). “... public works [sc. in New Zealand] may to a large extent be called both an industry in their own right and a powerful aid to industry and commerce in general. Public works have, of course, been used for many different purposes. During the depression they were, among other things, part of an elaborate system of unemployment relief. In the hands of the Labor government in 1936 onward they became an instrument for organizing economic recovery by the injection of purchasing power in the community, while at the same time resuming their basic function of developing the resources of the country. Within a couple of years of Labor’s return to office the Public Works Department had been thoroughly re-equipped and was employing over twenty thousand men, with an annual expenditure in the region of twenty million pounds. The range of work done by the department is very wide, the main items being roads, railways, public buildings, land improvement, and hydro-electric development. This last has been, indeed, one of the state’s main direct contributions to the country’s industrial progress.” (Wood 1944: 121). In addition, the government helped to finance home loans via central bank credit (Wright 2009: 57) which created a large stock of housing. All in all, New Zealand’s recovery shows the success of Keynesianism in action. (1) New Zealand’s population in 1933 was only 1,547,100. (2) These policies might have inspired the New Zealand Social Credit Party (1953– ), which, however, is probably not very appealing to left-wing people owing to that movement’s association with the right. Reading the original post again, I thought I left out some important economic data. So I have updated it. Chapple, S. 1994. “How Great was the Depression in New Zealand? A Neglected Estimate of Inter-war GNP,” New Zealand Institute of Economic Research (Inc), Wellington. Dimand, R. W. 2002 . Origins of Macroeconomics. Vol. 10, Routledge, London. Easton, B. 1997. In Stormy Seas: the Post-War New Zealand Economy, University of Otago Press, Dunedin. Hawke, G. R. 1985. The Making of New Zealand: An Economic History, Cambridge University, Cambridge and New York. Plumptre, A. F. Wynne. 1940. Central Banking in the British Dominions, University of Toronto Press, Toronto. Rankin, K. 1992. “New Zealand’s Gross National Product: 1859–1939,” Review of Income and Wealth 38.1 (March): 49–69. Rankin, K. 1995. “Unemployment in New Zealand at the Peak of the Great Depression,” University of Auckland, Working Papers in Economics No. 144. Sinclair, K. 1990. The Oxford Illustrated History of New Zealand (new edn), Oxford University Press, Oxford. Wood, F. L. W. 1944. Understanding New Zealand, Coward-McCann, New York. Wright, M. 2009. “‘Mordacious Years’: Socio-Economic Aspects and Outcomes of New Zealand’s Experience in the Great Depression,” Reserve Bank of New Zealand: Bulletin 72.3 (September): 43–60. My title refers to a proposal that Keynes made in 1931, when the UK was being wracked by the Great Depression. The depression had hit the country by 1930 and caused unemployment to soar to 2.5 million people (20% of the insured workforce). Now anti-Keynesians misinterpret and selectively quote Keynes’s comments on pyramid building and ditch digging, something which Keynes never seriously proposed, and also distort the meaning of those remarks, as I have shown here. “I read a few days ago of a proposal to drive a great new road, a broad boulevard, parallel to the Strand, on the south side of the Thames, as a new thoroughfare joining Westminster to the City. That is the right sort of notion. But I should like to see something bigger still. For example, why not pull down the whole of South London from Westminster to Greenwich, and make a good job of it — housing on that convenient area near to their work a much greater population than at present, in far better buildings with all the conveniences of modern life, yet at the same time providing hundreds of acres of squares and avenues, parks and public spaces, having, when it was finished, something magnificent to the eye, yet useful and convenient to human life as a monument to our age. Would that employ men? Why, of course it would! Is it better that men should stand idle and miserable, drawing the dole? Of course, it is not.” (Keynes 1951: 153). You won’t see that passage quoted by the haters of Keynes. The next time you hear some straw man nonsense from such people, my advice is to reply to them that Keynes was for clearing slums, not building pyramids! * For some reading on the horrors of life in those slums, at least in the Victorian period, see Dyos 1967. Dyos, H. J. 1967. “The Slums of Victorian London,” Victorian Studies 11.1: 5–40. Keynes, J. M. 1951. Essays in Persuasion, Rupert Hart Davis, London. Well, this would be an improvement on that absurd theory, if it were possible. A commentator on the last post complains that the Austrian business cycle theory (ABCT) – don’t you know?! – doesn’t even need a unique natural rate of interest / equilibrium rate of interest, despite the fact that every exposition of the theory I have seen relies on exactly that concept. “Put concisely, Wicksell’s theory is as follows: If it were not for monetary disturbances, the rate of interest would be determined so as to equalize the demand for and the supply of savings. This equilibrium rate, as I prefer to call it, he christens the natural rate of interest. In a money economy, the actual or money rate of interest (“Geldzins”) may differ from the equilibrium or natural rate, because the demand for and the supply of capital do not meet in their natural form but in the form of money, the quantity of which available for capital purposes may be arbitrarily changed by the banks. Now, so long as the money rate of interest coincides with the equilibrium rate, the rate of interest remains “neutral” in its effects on the prices of goods, tending neither to raise nor to lower them. When the banks, however, lower the money rate of interest below the equilibrium rate, which they can do by lending more than has been entrusted to them, i.e., by adding to the circulation, this must tend to raise prices; if they raise the money rate above the equilibrium rate—a case of less practical importance—they exert a depressing influence on prices.” (Hayek 2008 : 215). On that same page in Time and Money: The Macroeconomics of Capital Structure (2000), Garrison makes it clear that this rate is essentially the Wicksellian rate causing intertemporal equilibrium. “In his brief remarks [sc. in reply to Sraffa], Hayek certainly did not fully reconcile his analysis of the trade cycle with the possibility of multiple own-rates of interest. Moreover, Hayek never did so later in his career. His Pure Theory of Capital (1975 ) explicitly avoided monetary complications, and he never returned to the matter. Unfortunately, Hayek’s successors have made no progress on this issue, and in fact, have muddled the discussion. As I will show in the case of Ludwig Lachmann—the most prolific Austrian writer on the Sraffa-Hayek dispute over own-rates of interest—modern Austrians not only have failed to resolve the problem raised by Sraffa, but in fact no longer even recognize it. Murphy, to his credit, has pinpointed a very severe problem with modern ABCT (and I suppose it’s not a surprise to readers if I say he’s become one of favourite Austrians, not least of all because he supports a monetary theory of the interest rate). Murphy denies the existence of a unique natural rate, but he has yet to produce any work showing how ABCT actually works with its non-existence. On pp. 19–23 of his discussion of the subject in a very simple model, Murphy provides his attempt to show how an inflationary increase in the money supply can cause “people in earlier periods to consume too much,” but even he admits this is “not really an illustration of the Misesian trade cycle theory,” because his model does not “really exhibit malinvestments in longer production processes.” Murphy leaves the creation of such a model for his future research. He’s done no such research as yet. Nor has any other Austrian. As I pointed out in the last post, Hayek’s views on equilibrium changed in the course of his life. But in his early 1930s work on trade cycle theory he clearly assumed a state of equilibrium as a real world initial position in an economy subject to an Austrian trade cycle. I say this because a commentator on the last post persists in denying what is perfectly obvious. Readers who read the comments on that post will find a useful example of the irrational, obstinate and ridiculous fervour of “internet” Austrians, attempting to deny basic facts. I accept assumption (a), full employment. I am not sure that I quite know what (b) ‘static expectations’ means, but if it means that at each stage of the process everybody acts in the expectation that future prices will be the same as present prices, I accept that too – though we shall see that these expectations must be disappointed. Of (c) I can accept that at each stage in every separate market demand = supply in the sense that at the ruling price all buyers and sellers buy and sell as much as they want to buy at that market, but not in the sense that any change in the supply which a change in price will bring about in the course of time has already taken place or that prices correspond to the marginal costs at which producers now begin to produce. Nor need there [be] at any but the initial stage an overall equilibrium between the different markets, because a change of price necessary to secure equality between demand and supply in any one market will make at the next stage a change of other prices inevitable as a result of the changed receipts in the first market being spent. Let us now start with a system in full stationary equilibrium: constant prices and no net saving or investment and no changes in the supply of factors or tastes and a constant flow of money (which may be a token or partly credit money) ... (Hayek 1999: 100–102). “My present task is to fill in the details of that rough sketch and to show what happens in the interval before a new equilibrium is attained.” (Hayek 2008: 265–266). If Hayek thought at this stage in his career that equilibrium states can never occur in the real world, then what was point of his trade cycle theory? This subject is rather important for the validity and truth of Hayek’s trade cycle theory, and there seems to be confusion about the issue, especially from Austrians or internet Austrians trying to defend the Austrian business cycle theory (ABCT). Hayek’s model is not a static equilibrium theory. Hayek’s model is a dynamic model that, like Mises, utilizes the concept of a static state as a mental tool to understand the real world economy of constant changes. Hayek did not claim that markets do in fact clear. He argued that markets tend towards clearing, but because equilibrium is never reached, neither does clearing. The belief that equilibrium is never reached was, of course, a position that Hayek held after the 1940s when he had adopted the idea of “spontaneous order” as a replacement for equilibrium analysis. But this comment conflates Hayek’s different and conflicting views on equilibrium in the course of his whole career, and confuses the issue by making it appear that Hayek held a consistent and unified position on equilibrium throughout his entire life. That is false. Hayek’s view on equilibrium evolved over time, and the extent of the changes in his basic ideas has led some scholars to talk about Hayek I and Hayek II as phases in in his thought on methodology, and even three phases in his views on equilibrium (Gloria-Palermo 1999: 75). In the first phase down to 1937, Hayek thought that “all legitimate economic explanations should be based upon an analysis of equilibrium” (Gloria-Palermo 1999: 75; McCloughry 1984: viii). The second phase from 1937 to the 1940s involved Hayek’s attempt to redefine equilibrium as plan co-ordination, which occurred in his important paper “Economics and Knowledge” (Hayek 1937; Gloria-Palermo 1999: 75). From the 1940s, there was a third phase where Hayek broke with equilibrium analysis and created a new concept of “spontaneous order” as a method for studying coordination processes in market economies. F. A. Hayek, 1984 . “Intertemporal Price Equilibrium and Movement in the Value of Money,” in R. McCloughry (ed. ), Money, Capital and Fluctuations. Early Essays, Routledge & Kegan Paul, London. (2) The essay Monetary Theory and the Trade Cycle (1929) [English trans. 1933 by N. Kaldor and H.M. Croome] in Hayek 2008: 1–130). (3) Hayek’s first version of ABCT from his LSE lectures in Prices and Production (London, 1931). F. A. Hayek, von, 1935. Prices and Production (2nd edn), Routledge and Kegan Paul. F. A. von Hayek, Profits, Interest and Investment (London, 1939). The prevailing model of equilibrium in the 1920s was a simplified Walrasian stationary equilibrium model, which influenced Hayek when he began his trade cycle theory work. In these stationary equilibrium models, change is exogenous and the system moves by an equilibrating process to a new equilibrium when exogenous shocks occur. But Hayek wanted to analyse endogenous changes through the role of money in modern economies, and he acknowledged that an intertemporal equilibrium approach was necessary in his paper “Intertemporal Price Equilibrium and Movement in the Value of Money” (1928). Curiously, he then simply abandoned that framework in the first edition of Prices and Production (1931) and instead used a Wicksellian monetary equilibrium concept. In doing so, Hayek “reverted to the stationary equilibrium approach, by adopting the simple stationary-equilibrium model put forward by Wicksell in Interest and Money as the starting point for his analysis” (Donzelli 1993: 57). “Among the many shortcomings of the original Prices and Production model, the most evident, and probably the most embarrassing to Hayek himself, was the use of a stationary equilibrium apparatus that was wholly at variance with those continual changes in relative prices, production techniques, and composition of output that constituted the distinctive feature of Hayek’s trade cycle theory and the main object of its purported explanations. Hence, the first task Hayek set to himself in the early 1930s was to free … [General Equilibrium Theory] from the shackles of the stationary equilibrium approach (that he then used to call the «traditional» or «timeless» equilibrium approach), thereby turning the equilibrium construct into a tool suitable for discussing those «dynamic» aspects that lay at the very center of his trade cycle theory.” (Donzelli 1993: 59). “it is my conviction that if we want to explain economic phenomena at all, we have no means available but to build on the foundations given by the concept of a tendency toward an equilibrium. For it is this concept alone which permits us to explain fundamental phenomena like the determination of prices or incomes, an understanding of which is essential to any explanation of fluctuation of production. If we are to proceed systematically, therefore, we must start with a situation which is already sufficiently explained by the general body of economic theory. And the only situation which satisfies this criterion is the situation in which all available resources are employed.” (Hayek, Prices and Production in Hayek 2008: 225). “For a society then we can speak of a state of equilibrium at a point of time – but it means only that compatibility exists between the different plans which the individuals composing it have made for action in time. And equilibrium will continue, once it exists, so long as the external data correspond to the common expectations of all the members of the society. The continuance of a state of equilibrium in this sense is then not dependent on the objective data being constant in an absolute sense, and is not necessarily confined to a stationary process. Equilibrium analysis becomes in principle applicable to a progressive society and to those inter-temporal price relationships which have given us so much trouble in recent times. Hayek makes it clear in a footnote that his new definition separates the concept of equilibrium from that of a stationary state (Hayek 1937: 41, n. 1), and this is a dynamic conception of equilibrium. The problem for Hayek then became how people acquire the knowledge they need to co-ordinate their plans. Hayek’s last phase was to realise that equilibrium modelling is a wholly inadequate solution to that problem. “It is tempting to describe as an “equilibrium” as ideal state of affairs in which the intentions of all participants precisely match and each will find a partner willing to enter into the intended transaction. But because for all capitalist production there must exist a considerable interval of time between the beginning of a process and its various later stages, the achievement of an equilibrium is strictly impossible. Indeed, in a literal sense, a stream can never be in equilibrium, because it is disequilibrium which keeps it flowing and determining its directions. Even an apparent momentary state of balance in which everybody succeeds in selling or buying what he intended, may be inherently unrepeatable, irrespective of any change in the external data, because some of the constituents of the stream will be results of past conditions which have changed long ago.” (Hayek quoted in Caldwell 2004: 226–227). (2) Mises’s version in Monetary Stabilization and Cyclical Policy (1928) in Mises 2006 , The Causes of the Economic Crisis and Other Essays Before and After the Great Depression (Ludwig von Mises Institute, Auburn, Ala.), p. 99ff. (3) Hayek’s essay Monetary Theory and the Trade Cycle (1929) [English trans. 1933 by N. Kaldor and H.M. Croome] in Hayek 2008: 1–130). (5) Hayek’s first version of ABCT from his LSE lectures in Prices and Production (London, 1931). (6) Hayek’s second version of ABCT in Profits, Interest and Investment (London, 1939). (7) Hayek’s discussion in The Pure Theory of Capital (London, 1941). (8) Hayek’s 2nd edition of Prices and Production in 1935. (9) The version of Mises in Human Action: A Treatise on Economics (Auburn, Ala., 1998), pp. 568–583. (10) Rothbard’s development of ABCT in Man, Economy, and State: A Treatise on Economic Principles (Ludwig von Mises Institute, Auburn, Ala., 2004 ), pp. 994–1008; and in Economic Depressions: Their Cause and Cure (Ludwig von Mises Institute, Auburn, Ala. 2009 ). (11) M. Skousen’s interpretation in The Structure of Production (New York, 1990). (12) Gerald P. O’Driscoll and Mario J. Rizzo in The Economics of Time and Ignorance (2nd edn; Routledge, Oxford, UK., 1996), pp. 198–213. (13) The most recent developments of ABCT, as in Roger Garrison’s Time and Money: The Macroeconomics of Capital Structure (London and New York, 2000). A summary can be found in Garrison (1997). (14) the exposition in Jesus Huerta de Soto, Money, Bank Credit and Economic Cycles (trans. M. A. Stroup; Ludwig von Mises Institute, Auburn, Ala, 2006), pp. 265–508. Butos, W. N. 1985. “Hayek and General Equilibrium Analysis,” Southern Economic Journal 52.2: 332–343. Donzelli, F. 1993. “The Influence of the Socialist Calculation Debate on Hayek’s view of general equilibrium theory,” Revue Européenne des Sciences 31.96.3: 47–83. Hayek, F. A. 1941. The Pure Theory of Capital, Macmillan, London. Hayek, F. A. 2008. Prices and Production and Other Works: F. A. Hayek on Money, the Business Cycle, and the Gold Standard, Ludwig von Mises Institute, Auburn, Ala.
Loasby, B. J. 1998. “Co-ordination Failure: Economic Theory in the 1930s,” in P. Fontaine and A. Jolink (eds), Historical Perspectives on Macroeconomics: Sixty Years After the General Theory, Routledge, London. 53–64. McCloughry, R. 1984. “Editor’s Introduction,” in F. A. von Hayek, Money, Capital & Fluctuations: Early Essays (ed. by R. McCloughry), Routledge & Kegan Paul, London. vii–x. Salerno, J. T. 2002. “Friedrich von Wieser and Friedrich A. Hayek: The General Equilibrium Tradition in Austrian Economics,” Journal des Economistes et des Etudes Humaines 12.2: 357–377. “The static state can dispense with economic calculation. For here the same events in economic life are ever recurring; and if we assume that the first disposition of the static socialist economy follows on the basis of the final state of the competitive economy, we might at all events conceive of a socialist production system which is rationally controlled from an economic point of view.” (Mises 1990: 16). I am amazed how large numbers of Austrians seem aware of this view by Mises. But, as Mises himself admits, such static equilibrium states are imaginary: they do not exist in the real world. But transitioning from one equilibrium state to another is at the heart of Hayekian Austrian business cycle theory (ABCT), which is heavily influenced by neoclassical theory. “by the middle of the 1930s, problems with [Hayek’s] static equilibrium theory had become ever more evident, as questions of the role of expectations came to the fore and, and, with them, the recognition that earlier models had assumed perfect foresight” (Caldwell 2004: 224). “Hayek’s changing assessment of the importance of equilibrium theory has some consequences for our story. The most telling of these concerns Hayek’s trade cycle theory, a paradigmatic example of equilibrium theory, one that Witt (1997, 48) describes as ‘an impressive example of allied price theoretical reasoning that may even delight a Chicago equilibrium economist.’ But, as Witt goes on to observe, if one rejects the usefulness of equilibrium analysis, then Hayek’s step-by-set story of how the cycle unfolds, one in which ‘each single stage necessarily had to be followed by the next one’ (46), can no longer be maintained. Witt concludes that Hayek’s cycle theory may well be incompatible with his later theory of spontaneous orders, a concern that others have voiced” (Caldwell 2004: 228). This is another problem with ABCT. Mises, L. von. 1990. Economic Calculation in the Socialist Commonwealth (trans. S. Adler), Ludwig Von Mises Institute, Auburn University, Auburn, Ala.
“Transistors were developed in a private laboratory, Bell Labs, but it was a monopoly. There was no market and there was no consumer choice. Since it was a government-supported monopoly, they could charge monopoly prices, which is in effect a tax. As long as they had the monopoly, Bell Labs was a very good lab. They did all sorts of things at public expense. As soon as it was deregulated, Bell Labs went down the tubes. Quite apart from that, Bell Labs was using state-generated wartime technology. Furthermore, they had nobody to sell the transistors to. For about ten years, the only market for high-quality transistors was the government, just like computers. During that period they were able to develop the technology, the scale, the marketing skills so that finally they could break into the market system.” (Barsamian and Chomsky 2001: 18). “The real success of Japanese producers, American industry sources conclude, came only after the mid-1970s. [The Ministry of International Trade and Industry] targeted the computer and telecommunications markets as central to Japan’s future. Establishing a national goal to lead in those industries, the government offered substantial incentives to encourage R&D and investment, besides restricting foreign access to Japanese markets.” (Okimoto et al. 1984: 17). The Japanese industrial policy was so successful that America semiconductor manufacturers were under extreme pressure by Japanese competitors by the 1980s (Nester 1997: 115–116), especially by the dumping of dynamic random access memory chips (DRAMs) on world markets. The American response to that Japanese threat was protectionism in the form of the Semiconductor Trade Agreement (STA) in July 1986 and tariffs on Japanese electronics imports in April 1986, to give US manufacturers relief. This eventually allowed them time to innovate and develop new generations of microprocessors and regain market share. Barsamian, D. and Chomsky, N. 2001. Propaganda and the Public Mind: Conversations with Noam Chomsky, Pluto Press, London. Nester, W. R. 1997. American Industrial Policy: Free or Managed Markets?, Macmillan, Basingstoke. Okimoto, D. I. et al. (eds). 1984. Competitive Edge: The Semiconductor Industry in the U.S. and Japan, Stanford University Press, Stanford. This is Behavioral Finance lecture 7 by Steve Keen on endogenous money and circuit theory. Posted below is an interview with Roger Garrison, part of which appears in the documentary the Panic of 2008. I am principally interested in his comments from 7.47, where talks about the Austrian business cycle theory (ABCT). All of the flaws of ABCT are in display. (1) Garrison blames the central bank for the crisis, and repeats the ABCT explanation. Garrison relies on the unique natural rate of interest concept, which simply does not exist. (2) Garrison ignores the role of asset bubbles funded by excessive consumer debt. (3) His “free market in loans” explanation of the interest rate is a flawed real theory of the interest rate. Its analysis is an invalid attempt to model a modern monetary economy as though it were a barter economy where loans are made in real goods. (4) Roger Garrison reveals that he is a free banker. He attempts to blame the central banks for over-issue of money, and absolve fractional reserve banking of responsibility. This strikes me as highly problematic. If Garrison is a free banker and supports banks issuing fiduciary media (in a commodity money system), then surely (according to Garrison’s own logic as the leading proponent of ABCT), it will be recipe for an economy hit by perpetual Austrian trade cycles. The idea that competitive free banking will not over-issue notes strikes me as devoid of any empirical evidence: many countries had no central bank in the 19th century (Australia, the US etc. ), yet these nations still had business/trade cycles. Unless Garrison wants to explain those cycles without ABCT, then what caused these business cycles? (5) Garrison admits that QE1 and QE2 have not increased the broad money supply significantly. Yet he still conjures up scare-mongering images of hyperinflation by the excess reserves entering the economy. Garrison’s idea that we are in unchartered territory with QE is false. Japan already did QE from 2001 to 2006. Japan’s experience with QE shows us how nonsensical these ideas are, and confirms the endogenous theory of money. Deflation continued for years despite QE by the Bank of Japan. Lending is demand constrained, and central banks can drain excess reserves without difficulty. If one wants to stop cheap money from a zero interest rate policy (ZIRP) or QE from being used in commodity and asset speculation, one can impose financial regulation on the flow of credit. (7) The claim that the New Deal made everything worse is false. America experienced a recovery from 1933–1936 under Roosevelt, with high real GDP growth and falling unemployment. When contractionary fiscal and monetary policy was implanted in 1936-1937 the economy collapsed into recession. The recovery in 1937 onwards was accomplished by increased fiscal policy. While the cartelist and price-fixing elements of the National Industrial Recovery Act (NIRA) were hardly any great aid in recovery and may have harmed it, this was the view of Keynes himself. (8) Garrison’s explanation of stagflation does not move beyond a simple critique of neoclassical synthesis Keynesianism. He displays no knowledge of Post Keynesianism, or the fact that stagflation can be easily explained by Keynes’s General Theory. I write it because the issue continues to pop up now and again. The fundamental point is that the Austrian Anarcho-capitalists supporting natural rights theory are the ones subject to this problem. The Austrian advocates of a limited state justified by utilitarianism would be capable in principle of evading it by endorsing some form of government intervention. And, as I have pointed out before, it is useless for anarcho-capitalists to try and evade the question by claiming that the situation imagined is “unrealistic” or “unlikely.” Hypothetical scenarios that are possible are perfectly legitimate to test ethical theories and their implications. “Every century or so, a 10-meter meteor slams into the Earth with the force of a small nuclear device. Tunguska was the site of the last, in 1908, and it was pure luck that that meteor landed in the uninhabited wilderness of Siberia. Every few thousand years, Earth can pass through unusually thick parts of the debris trail of comets, turning the familiar light show of a meteor shower into a deadly firestorm. Roughly every 100,000 years, a projectile hundreds of meters across unleashes power equal to the world’s nuclear arsenals. The result is devastation over an area the size of England, global tidal waves (if the impact is in the ocean), and enough dust flung into the atmosphere to dim the Sun and kill off vegetation. That could ruin your day. Chris Impey, “The End of the World as we Know It,” Independent, 14 June 2010. We live in a dangerous, dangerous universe indeed, and humanity in fact needs to devote itself to detecting and dealing with threats like this. Centre to Monitor Asteroids Opens, Guardian, 18 April 2002. Robert Matthews, “Britain Leads Defence Against Asteroid Impact,” Telegraph, 1 March 2001. Furthermore, the technology required for actually doing something about any such threat now exists because it has been developed in the state sector, with decades of government funding to programs like NASA. If such a threat occurred and the solution required not just national mobilisation of resources and labour, but international co-operation by governments as well, the pure natural rights libertarian would be forced to condemn such coercive measures as an immoral violation of private property rights. The extinction of the human species in scenarios where government intervention would be required to save it follows logically from natural rights ethical precepts. That is a very high price to pay for a theory which also lacks any credible justification. The two major Austrian defences of absolute rights to property are Rothbard’s natural rights theory (which I have criticised here) and Hoppe’s argumentation ethic. Neither overcomes the ought from is dilemma of Hume. In the case of Hoppe, one can note that, just because you require the use of certain body parts in debate, it simply does not follow from this that you have any absolute moral right to the use of your body or of any external property.